A Nasa telescope has discovered bulky black holes lurking where they are least expected - in skinny galaxies. So-called supermassive black holes were thought to reside at the cores of nearly all galaxies. But svelte galaxies lacking a central concentration of stars - or bulge - were thought to be a rare exception. The latest results from the Spitzer Space Telescope suggest this is not the case - and even these harbour hefty black holes. The findings indicate a central bulge is not essential for black holes to grow - as had been thought. Instead, the invisible quantity known as dark matter could play a role early in the development of black holes. The findings were presented here at the 211th meeting of the American Astronomical Society (AAS) in Austin, Texas. 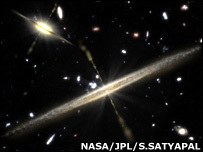 Thin spiral galaxies come with and without a central bulge of stars. Our own Milky Way is an example of a spiral with a bulge. From the side, it looks like a plane seen head-on with wings extending out to the sides. Fatter, elliptical galaxies, meanwhile, are a bit like one big bulge of stars. Previous observations had suggested that the more massive the bulge in a galaxy, the bigger the black hole. So it seemed reasonable to think that the formation and growth of galactic bulges must be intimately linked to their central black holes. Now, Shobita Satyapal, of George Mason University in Virginia, US, and her colleagues have discovered eight active supermassive black holes in skinny galaxies with minimal star bulges. "Prior to this discovery there was only one example of an active black hole in a galaxy with no bulge," said Dr Satyapal. "These observations show that it's not an anomaly for a super-thin galaxy to harbour a supermassive black hole. This constitutes the best evidence yet that a bulge is not a necessary ingredient for a black hole to exist and grow." These have been difficult to detect in the past, because bulgeless galaxies also tend to be very dusty. The dust lets little visible light escape. But by looking at objects in the infrared part of the electromagnetic spectrum, astronomers are able to see through cosmic dust. Using Spitzer, they were able to detect the signatures of active black holes in galaxies millions of light-years from Earth. Black holes swallow matter in their vicinity. But these "feeding" black holes also spit out high energy light that ionises much of the gas in the core of a galaxy. In this case, Dr Satyapal discovered the unique fingerprint of neon-5, a highly ionised form of this element. Stars are incapable of producing neon-5 - only a feeding black hole has the energy to excite the element to this ionised state. The researchers are to publish their research in an upcoming issue of the Astrophysical Journal.